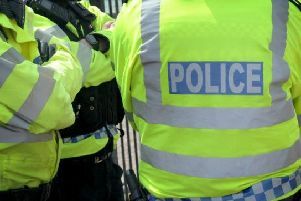 Police are investigating a robbery which took place in Rugby on Sunday morning. Shortly after 5.15am two men entered Madden’s newsagents in Hillmorton Road where they assaulted a member of staff with their fists. They then forced open the till and made off with a quantity of cash and cigarettes. It is believed that they went in the direction of Featherbed Lane recreation ground. The member of staff, a man, suffered a bruise to his forehead. The offenders are described as men in their late 20s wearing dark clothing. Police are aware that there were customers present after the attack and would like them to make contact as soon as possible as they may have valuable information. Anyone who witnessed any suspicious activity in the area early this morning, or has any information which would help with the investigation, is asked to call Warwickshire Police on 101 or contact Crimestoppers, anonymously, on 0800 555 111 or through its website www.crimestoppers-uk.org quoting incident 61 of 13 November.